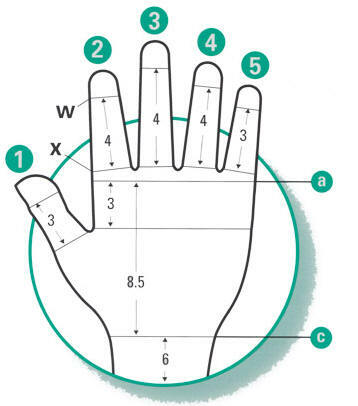 Measure the length of your hand from the wrist (c) to the line across your knuckles (a). Use the chart above to determine your size. (1-6). If your measurements do not all fit within the same size, you may need a custom glove. Talk to your therapist or doctor. Measurements are listed in centimeters, as they are easier to use with small lengths. Use the chart above to determine your size. (1-4 or S,M,L,XL). If your hand does not fit within the sizes listed, you may need a custom gauntlet. Talk to your therapist or doctor.